All discussions, images & information regarding US military aviation (Air Force, Navy, Marines, Army or anything else) other than the F-22 Raptor & F-35 JSF (which will have separate threads) may be posted here. via Aviation Week: "Exactly how Boeing's MQ-25 “Stingray” UAV is directed around the carrier deck is a company secret"
US Navy Super Hornet from the Strike Fighter Squadron 213 crashes. The pilot and the weapon system officer both died in the accident despite ejecting. RIP. A series of strategic aircraft movements, including the congregation of a dozen KC-10s tankers, signaled a major operation was underway. It started around 4pm PST when no less than a dozen KC-10 tankers began to pop up over the central United States. Around the same time, spotters in Minneapolis-St. Paul looked up to see a quartet of B-2 bombers barreling their way towards the southwest, their contrails streaking across the sky. It seems that two other groups of B-2s, another four-ship formation and a two-ship formation, followed shortly after. That is half the B-2 fleet in the air together at one time—something was clearly going on. Raytheon Missile Systems (RMS) has finalised the developmental testing (DT) campaign for the GBU-53/B Small Diameter Bomb Increment II (SDB II) network-enabled precision-guided glide munition. Developed under a US Air Force (USAF) and US Navy (USN) joint interest programme (with the USAF as the lead service), the SDB II is a 250lb-class unpowered miniaturised precision attack weapon designed to provide tactical aircraft with an ability to strike mobile/relocatable and stationary targets at range (stated as up to 40 n miles [74 km]), in all weather conditions, and with limited collateral damage. RMS is the prime contractor for the SDB II programme. Weighing 94.3 kg (208 lb), 177 cm (70 in) in length and 17.8 cm (7 in) in diameter, SDB II features a dual-waveform datalink - for in-flight target updates, in-flight re-targeting, weapon in-flight tracking, and weapon abort - flip-out wings to achieve stand-off range, GPS/INS navigation for mid-course guidance, an advanced tri-mode (millimeter wave (MMW), imaging infrared and semi-active laser) seeker for terminal engagement, and a low-collateral, multi-effects warhead. The SDB II design features three attack modes: normal - the primary mode to engage moving targets through weather using MMW radar and IR for terminal guidance; laser illuminated attack – using the laser spot tracker for terminal guidance; and co-ordinated attack mode: to attack fixed or stationary targets at a given set of co-ordinates. During the DT campaign, some 44 SDB II munitions were dropped and tested from a USAF F-15E Strike Eagle – the weapon’s threshold platform - using all modes of operation and including strikes against manoeuvering targets in adverse weather conditions, demonstrating third-party control through the datalink, and discriminating a correct target from among decoys. WASHINGTON ― The Pentagon plans to invest more than $20 billion in munitions in its next budget. But whether the industrial base will be there to support such massive buys in the future is up in the air — at a time when America is expending munitions at increasingly intense rates. The annual Industrial Capabilities report, put out by the Pentagon’s Office of Manufacturing and Industrial Base Policy, has concluded that the industrial base of the munitions sector is particularly strained, something the report blames on the start-and-stop nature of munitions procurement over the last 20 years, as well as the lack of new designs being internally developed. Some suppliers have dropped out entirely, leaving no option for replacing vital materials. Other key suppliers are foreign-owned, with no indigenous capability to produce vital parts and materials ― setting up the risk that a conflict with China could rely on Chinese-made parts. And the military’s desire to tinker with existing designs rather than create band-new weapons has left the industrial base with a lack of design experience, which means “design skills for critical components within the missile sector industrial base are at risk,” the authors write. All this is happening as the U.S. is expending munitions at a rapid rate. For instance, the Special Inspector General for Afghanistan Reconstruction concluded that 1,186 munitions were dropped in that country during the first quarter of 2018 ― the highest number recorded for the first three months of the year since tracking began in 2013; that number is also more than two and a half times the amount dropped in the first quarter of 2017. Mackenzie Eaglen, a defense expert with the American Enterprise Institute, said figures in the report line up with worries from senior military leaders over the last two years. America’s critical minerals problem has gone from bad to worse. Without access to such minerals, our precision-guided missiles will not hit their targets, our aircraft and submarines will sit unfinished in depots, and our war-fighters will be left without the equipment they need to complete their missions. An overall issue identified by the report is a lack of diversity in the industrial base, as well as a lack of knowledge on how to develop new systems. “The loss of this design and production capability could result in costly delays, unanticipated expense, and a significant impact to many current and future missile programs, damaging the readiness of the Department [of Defense] and negatively impacting a foundational national defense priority by placing the ballistic missile production capability at risk,” according to the report. As to diversity in the industrial base, well ― there isn’t any, with the authors concluding that Raytheon and Lockheed Martin account for about 97 percent of the DoD’s munitions and missile procurement funding. But while those two firms are doing well, there are concerns about sub-tier suppliers in the realm of “thermal batteries, SRMs [solid rocket motors], fuzes, jet engines, inertial measurement units (IMUs), GPS receivers, seekers, and warheads,” as well as how healthy that base will remain in the future. Thermal batteries. Used in all DoD missiles and guided munitions, there is one (unnamed) manufacturer of these technologies who controls about 80 percent of the market. Should something happen to that company, the DoD’s munitions stock could be endangered. In addition, the near monopoly means there has been a lack of investment in improving the technology. Fuzes. Used on all munitions, there is actually an excess of fuze capacity in the industrial base, due in part to improvements in other areas making the fuze less important. “Excess capacity limits manufacturers from being cost competitive and limits investment in improvements to fuze technologies, including sustaining a viable design engineering cadre,” the authors write. Small turbine engines. There are currently two companies involved in this sector, but one ― Teledyne Turbine Engines ― has announced it will be leaving the business in 2018, leaving only Williams International to supply this capability. Overall, the authors found that of the 121 second-tier suppliers for munition capabilities, 98 percent of them were single/sole source. And of the 73 third-tier suppliers, 98 percent were also single/sole source. There are also concerns about materials used in the systems. For example, the department is facing rising costs for ammonium perchlorate, used in almost all DoD missile programs. The sole producer, American Pacific, is only operating at 10-15 percent of capacity due to limited demand; as a result, there have been large increases in cost per round of chemical compound, a trend likely to continue into the 2020s. And the sole producer of dimeryl diisocyanate, a key propellant ingredient used in systems like the AIM-9X and AMRAAM missiles, has informed the Pentagon it will be leaving the business shortly, leaving the DoD with “no qualified source” of the material. The Pentagon is left to scramble to find potential replacements for these materials, which the authors optimistically conclude could be “the beginning of what could serve as a model for mitigating material obsolescence in the future.” But Eaglen thinks the issue of foreign suppliers needs to be dealt with quickly, or risk getting out of hand. “It’s worrisome enough for a capability that is essential in hostilities that policymakers will likely want to start considering special protections and/or subsidies when needed,” she said. “I’m not sure the bell can be un-rung in the case of Chinese suppliers. U.S. Navy Inducts MQ-4C Triton Unmanned Aerial Vehicle Into Service Ahead Of First Operational Deployment to Guam. In a stunning story of split-second decision-making under pressure, heroic, selfless action and remarkable airmanship, the drama of what really happened in a burning B-1B bomber over Texas on May 1, 2018 has finally been revealed. Earlier this week in Washington, Secretary of the Air Force Dr. Heather Wilson finally told reporters and Air Force personnel what has been secretly talked about on back-channels since the incident occurred, Air Force Times Tara Copp reported. A B-1B supersonic heavy bomber from the 7th Bomb Wing at Dyess Air Force Base in Texas was returning from a routine training sortie on May 1. The aircraft’s young crew of four, the senior aircraft commander- likely the instructor, the copilot, an offensive systems operator, and the defensive systems operator are on board. The names of the crew have not yet been released. A fire warning light illuminated in the cockpit. According to credible reports, it was likely the number three engine on the aircraft’s right wing located closest to the fuselage. The number two and number three engines are the closest to the complex apparatus that moves the B-1B’s variable geometry swept wings. They are also close to the aircraft fuel tanks. The crew initiated the emergency checklist procedures for extinguishing a fire in an engine. It was likely calm but businesslike in the cockpit. The fire continued. The final item on the emergency checklist is: “Eject”. The early B-1A prototypes were originally designed with a crew escape capsule that rocketed off the fuselage as one unit. The escape capsule was not engineered into production B-1B bombers when the program was renewed in 1982 by the Reagan administration. As a result, four lighter weight individual Weber Aircraft ACES II (Advanced Crew Ejection Seat II) ejection seats were installed in production B-1Bs. The ACES II is a proven and effective ejection seat with well over 600 successful crew escapes and the lowest frequency of user injuries of any ejection seat in history. When the aircraft commander ordered the ejection of the crew from the burning aircraft over Texas the first crewmember to actuate their ejection seat was the right/rear seat on the aircraft, the Offensive Systems Operator. When the crewmember pulled the ejection seat handles the hatch above the OSO’s ejection seat exploded off the aircraft. But the Offensive Systems Operator ejection seat did not fire. The Offensive Systems Operator was trapped under an open hatch on an armed ejection seat in a burning aircraft. Other than having a fire in the cockpit, this was a worse-case scenario. Having cancelled the ejection of the crew from the burning bomber, the aircraft commander declared an emergency and diverted to Midland International Air and Space Port between Midland and Odessa, Texas, over 150 miles from their original base at Dyess AFB. The pilot and flight crew flew the B-1B the entire way to Midland while it was on fire with a missing hatch, had no cockpit pressurization and an armed ejection seat that could fire at any moment without warning. Even the impact of a normal landing could have triggered the ejection seat to ignite its rockets and leave the aircraft. The crew recovered the aircraft to Midland without injury or further damage to the aircraft, saving every member on board and the 400 million-dollar B-1B. Composite image made from FB/Time Fischer/Midland Reporter photographs that show the missing hatch. The B-1 incident led to a temporary stand-down of the whole B-1 fleet as all ejection seats were inspected. The grounding was lifted on Jun. 19. Following a successful flight testing of Collaborative Miniature Air Launched Decoy (MALD-X) air-launched decoys last week, the US Navy plans to complete the development, transforming the decoy into a navalized, miniature networked ‘EW cruise missile’ designed for platforms such as the Super Hornet and Growler E/A-18G. Since 2015 the program was managed by the Pentagon’s Strategic Capabilities Office, in cooperation with the Air Force and the Navy. In the past 24 months, Raytheon modified the powered decoy into a quick-change, network-enabled EW payload carrier. The flight tests of the advanced decoys were conducted at the Naval Air Warfare Center Point Mugu, California, on August 20 and 22. The Navy will complete system development and transition to an operational capability. The Navy will pursue enhancements to the system and additional mission sets that will be tested in 2019. Eventually, the Navy plans to introduce the technologies explored in MALD-X into the navalized MALD-N decoy currently being developed for the Navy by Raytheon. The ADM-160 was developed by Raytheon as a decoy, and modified into a ‘stand-in’ flying jammer under the MALD-J program. Weighing less than 300 pounds, the weapon has a range of approximately 500 nautical miles (575 statute miles). After it is launched from its host aircraft, the MALD decoys flies a preprogrammed mission, operating alone or in pairs. As a network enabled platform, MALD-X (and MALD-N) will be able to operate in ‘swarms’ of many decoys, thus overwhelm enemy air defenses and better respond to unexpected threats, it will be able to retask or employ techniques based on parameters they receive over the data link. “MALD-X gives future warfighters the ability to focus on the nature of the emerging threats rather than being encumbered by the burden associated with making a system interact with mission elements and mission supporting actions,” said Matthew O’Connell, MALD-X Program Manager. 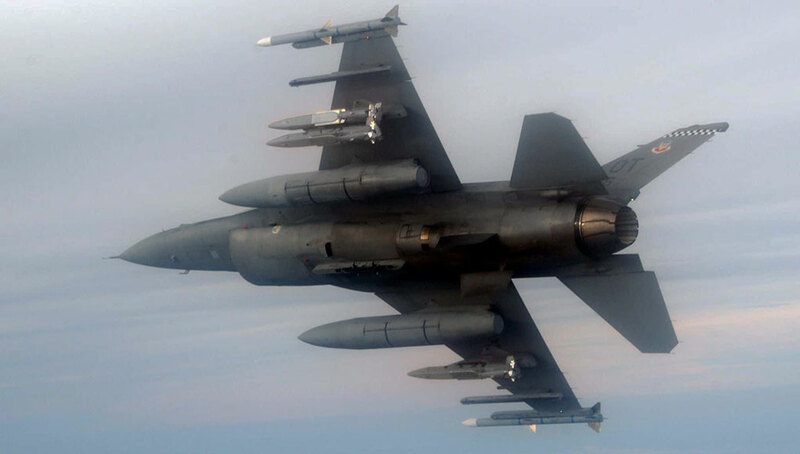 The new decoy builds on the Air Forces’ successful MALD-J program of record. Designed for low-level operation, carrying a data-link and modular payload attachments, MALD-X introduces dramatic tactical advantages derived by the use of collaborative, expendable platforms employing advanced electronic warfare techniques. Last month, the Air Force awarded Raytheon a $96 million contract to produce 250 enhanced MALD-J decoys. The enhanced MALD-J incorporates an improved GPS aided inertial navigation system (GPS/INS) that better cope with GPS denied environment. In the past decade, Raytheon delivered about 2,000 MALD decoys. The MALD-J variant entered production in 2012 and is currently operational with F-16s and B-52. A specialized launch system was also developed for the deployment of multiple MALDs from the ramp of cargo aircraft. Chicago-based Boeing has been awarded an $805 million contract to develop the Navy's MQ-25A unmanned aerial refueling drone, the Navy announced Thursday, handing the company's Arlington-based defense business a much-needed win. Bethesda, Md.-based Lockheed Martin and San Diego-based General Atomics had also vied for the opportunity. Under the terms of the contract, Boeing is to produce four of the unmanned aircraft by 2024, the first major step in a defense program that is expected to eventually exceed $7 billion. Boeing's defense, space and security president and chief executive Leanne Caret attributed the company's win to its experience with Navy aircraft and close understanding of the service’s needs. A Lockheed Martin spokeswoman said the company would meet with the Navy to determine next steps. The company has not ruled out protesting the contract win. The MQ-25 is viewed as an important program for the Navy because it should extend the flying range of deployed fighter jets like the F/A-18 Super Hornet and F-35 Joint Strike Fighter, giving them easier options to refuel in midair. The contract is likely to be viewed as a major win for Boeing's Arlington, Va.-based defense business, which has been smarting from a string of high-profile losses on the F-35 Joint Strike Fighter, which was awarded to Lockheed Martin, and the B-21 Raider, which went to Northrop Grumman. The company is anxiously awaiting a decision from the Air Force on the T-X Trainer program, an estimated $16 billion program, with an announcement expected by the end of 2018. Loren Thompson, a defense consultant with the Lexington Institute, a think tank that gets funding from defense contractors, characterized the contract win as a "breakthrough" for Boeing that tightens the defense giant’s grip on the U.S. Navy’s major aircraft procurements. Perhaps more importantly, the contract gives Boeing its first substantial foothold in the U.S. military’s autonomous aircraft efforts. That market has been largely dominated by General Atomics, the manufacturer of the MQ-9 Reaper drone. “If Boeing were to win both the MQ-25 and the Air Force’s T-X Trainer, that would be perceived as a major turning point for its defense business,” Thompson said. Richard Aboulafia, an aviation expert with the Teal Group consultancy, said the contract win should solidify the company’s grip on the Navy’s aviation projects. “What makes this an important win is that the overwhelming majority of Navy carriers will be filled by Boeing planes for decades to come,” Aboulafia said. WASHINGTON — A Boeing-Saab partnership has won a $9.2 billion contract to produce the U.S. Air Force’s next-generation training jet. Boeing’s award for the T-X trainer programmarks the third major victory by the company in about a month, following an $805 million contract to build the Navy’s first four MQ-25 unmanned tankers, and a contract worth up to $2.38 billion to manufacture the Air Force’s Huey replacement helicopter. The T-X downselect was first reported by Reuters. As the winners of the competition, Boeing and Swedish aerospace firm Saab are set to capture sales of at least 351 training jets to the U.S. Air Force, with possibly more in the international market. The program promises to keep Boeing’s tactical aircraft business strong after the F-15 and F/A-18 Super Hornet lines disappear in the next decade. The indefinite-delivery/indefinite-quantity contract will allow the Air Force to buy up to 475 aircraft and 120 simulators, the Air Force said in a Sept. 27 statement, although the current plan is to buy 351 T-X aircraft, 46 simulators and associated ground equipment. The Air Force stated that the T-X program originally was to cost about $19.7 billion, and that Boeing’s bid shaved $10 billion off that amount. Although the contract could be worth up to $9.2 billion, that sum is by no means a sure thing for Boeing. During a briefing with reporters on Thursday afternoon, Will Roper, the service’s acquisition executive, and Lt. Gen. Arnold Bunch, its top uniformed acquisition official, said the $9.2 billion amount would be obligated to Boeing if the service executes all of options that would allow it to buy more aircraft at a quicker pace, purchasing all 475 planes. Additionally, Boeing assumes the preponderance of the risk with the T-X program, which starts as a fixed-price incentive fee contract, but at the fifth lot will transition to a firm-fixed price structure, Roper and Bunch said. Boeing and Saab’s clean-sheet trainer, designed specifically for the Air Force, beat out Leonardo DRS and a Lockheed Martin-Korea Aerospace Industries partnership. Throughout the competition, the Boeing-Saab jet was seen as the front-runner by analysts like Roman Schweizer of Cowen Washington Research Group, who pointed to Boeing’s aggressive bidding strategy and ability to absorb financial losses on programs like the KC-46 tanker aircraft. The T-X program is the Air Force’s last major aircraft procurement opportunity up for grabs for some time, as the service’s contracts for its next-generation fighter, tanker and bomber have already been awarded, as have the last remaining new-start helicopter contracts. As such, the decision could potentially trigger a protest with the Government Accountability Office. But Roper and Bunch pointed to the repeated interaction with industry through the competition, which could shield it from a protest, and lessons learned from previous programs on how to structure a competition. Roper also defended the service’s selection of Boeing’s design, which was the only proposed aircraft that was not a modified version of an existing plane. “We have a very deliberate process to evaluate risk, cost, and technical factors in the program and so its rigorous because we do have to evaluate things that have variances in them. The team looked at that, rolled up cost benefit, technical factors sand risk, to give best value to the government and overall our assessment was Boeing had a proposal that was best value,” Roper said. Under the initial $813 million award, Boeing will be responsible for delivering five T-X aircraft and seven simulators, with the first simulators arriving at Joint Base San Antonio-Randolph, Texas, in 2023. According to the T-X request for proposals issued in December 2016, the Air Force will then execute contract options for two batches of low-rate production and eight rounds of full-rate production. The contract also includes ground training systems, mission planning and processing systems, support equipment, and spares. Initial operating capability is planned by the end of fiscal 2024 when the first squadron and its associated simulators are all available for training. Full operational capability is projected for 2034. Beyond the 351-aircraft program of record, analysts have speculated there could be significant international interest in T-X from countries that plan to fly the F-35 fighter jet or from the U.S. Air Force as it considers buying new aggressor aircraft for air-to-air combat training, making the opportunity potentially even more lucrative. Although each of the three competing teams offered very different trainers to the Air Force, they were united by their cooperation with international aircraft manufacturers. Boeing partnered with Saab, which is building the aircraft’s aft fuselage and other systems. The team produced two single-engine, twin-tailed prototypes, which were unveiled at Boeing’s St. Louis, Missouri, facility to much fanfare in 2016. Saab promised that, should the partnership emerge victorious, it would build a new plant in the United States for its T-X work, although a location has not been announced. Leonardo DRS and Lockheed Martin offered modified versions of existent designs, hoping that a mature aircraft would be more palatable as the U.S. Air Force continues to foresee budgetary challenges in its future. DRS’ T-100 is based on the Leonardo M-346 trainer, which is being sold to two F-35 users — Italy and Israel — as well as Singapore. Leonardo initially looked to partner with a big-name U.S. defense prime, first joining with General Dynamics and then, when that teaming agreement fell apart, Raytheon. Ultimately, Leonardo and Raytheon couldn’t agree on pricing for the T-100, leading that partnership to also break up in January 2017. The collapse of the deal between Raytheon and Italy’s Leonardo to offer the T-100 jet trainer in the US T-X competition followed Leonardo’s refusal to cut the price of the aircraft by as much as a third, Italian sources have told Defense News. After Leonardo DRS was tapped to prime the program, the company announced its intention to do structural subassembly, final assembly and check out of the aircraft stateside at Moton Field in Tuskegee, Alabama, where it would build a new $200 million facility. Lockheed Martin meanwhile joined with Korea Aerospace Industries — a longtime collaborator who manufactured South Korea’s version of the F-16 — for a modified version of KAI’s T-50. Lockheed said that its T-50A would be built in Greenville, South Carolina, where it also plans to fabricate the F-16 in the future. Jeffrey Parker certainly looked the part of dynamic, young CEO. Dressed in a stylish light gray “skinny” suit, he was standing at a podium under an event tent (bracketed by two parked fighter jets), delivering a short speech of thanks to the three dozen or so local officials and media types who turned out for his company’s groundbreaking ceremonies at bustling Alliance Airport. As proof that you can take the pilot out of the cockpit, but can’t take the cockpit out of the pilot, JD (the nickname/call sign that Parker typically goes by) couldn’t stop himself from mentioning that only the day before he’d been flying old IAI Kfir fighters at NAS Oceana in Virginia Beach, Virginia, against U.S. ships and carrier- and land-based F-35s. For 22 years, ever since the U.S. Air Force Academy graduate and veteran of both operations Desert Shield and Desert Storm launched the world’s very first adversary air training company called Airborne Tactical Advantage Company (ATAC), Parker has been just as much a pilot as he has been a business man. However, getting away from his desk and away from meetings with investors, employees and, now, executives of ATAC’s new parent company, Textron, so that he can fly as a mock-bad guy against frontline U.S. military pilots is bound to get harder and harder. Parker now sits atop a civilian organization that owns more than 90 fighter jets, all of which are dedicated to making U.S. and international allied war fighters better prepared to fend off or take in enemy air assets. And with multiple multi-million-dollar U.S. Navy, Air Force, Marine and even Army contracts currently or soon-to-be up for bid, ATAC and its principal competitors Draken International, TacAir and Top Aces are gearing up to bid for and win big shares of that work and revenue. Although Parker still very much enjoys the flying part of his job, the businessman part almost certainly will be consuming an ever larger share of his time. Indeed, that’s why Parker and other ATAC and Textron leaders were in Fort Worth, Texas, recently. Last year ATAC, backed by Textron’s money and Textron CEO Scott Donnelly’s thirst for larger revenues, ATAC bought the French Air Force’s entire fleet of Dassault Mirage F1s. That’s 63 planes in total, plus more than 150 spare engines and millions of spare parts. Eventually all 45 of the F1s that ATAC plans to restore to flying condition, plus the remaining F1s in that French Air Force batch and all the added spare parts and engines, will be based at Alliance Airport in what the company is calling its Adversary Center of Excellence. That facility also will become the work home of 200 or more maintainers, pilots and administrators. Parker said ATAC chose the Alliance location as home base for its F1 fleet because its mid-continent location means it can deploy planes quickly easily to any training location in the nation and because of the overwhelming abundance of highly skilled and experienced aircraft maintainers, technicians, engineers and program administrators available in the aviation-dominated North Texas market. The icing on the cake, he said, is that Textron-owned sister company Bell is headquartered only a few miles away and operates its own training facility at Alliance. By next summer, Parker expects the first 13 or so F1s to be flying in support of U.S. military training missions. Though Parker is an Air Force man at heart, and though ATAC has done work for the Air Force and Marines from time to time, the Navy always has been ATAC’s primary customer. But the big news in the adversary air, or ADAIR, training world is a huge new opportunity for ADAIR companies to take over essentially all of the Air Force’s adversary training flying work — approximately 40,000 hours a year worth of adversary air time — over a 10-year period beginning next year. In June, the Air Force issued requests to ADAIR companies to submit proposals for a variety of adversary training roles. Altogether that work is being valued by the community at around $7.5 billion, and the Air Force expects it to be distributed in at least 22 (perhaps more) different work assignments to be parceled out to various ADAIR providers. Not only is that expected demand large enough to consume all the available air and crew time of all the ADAIR competitors’ existing fleets, most of them are, like ATAC, scouting frantically around the world for more planes. Most specifically they are looking for old third-generation frontline fighters, like the F1, that they can acquire and upgrade to fourth-generation standards. They are also looking for early models of fourth-generation fighters like the F-16 that still have enough life left in their airframes to be put back to use as top-of-the-bad guys in advanced training programs like Red Flag and TOPGUN. Parker said the Navy was the first to figure out that contracting out adversary air training work to private operators saves the military lots of money. Just as important, it saves them hours on their frontline airframes. Plus it helps mightily in addressing the service’s nagging pilot-shortage problem. Instead of having to send F-18s — and their Navy pilots — back into the air to play the role of bad guys so other Navy pilots can get in some realistic training, ATAC and its competitors now fly relatively inexpensive third, and even second, generation super- and sub-sonic aircraft in those bad guy roles. They use highly experienced but retired fighter pilots, like Parker, to provide that kind of training to active duty and reservist pilots and their planes. More recently, Parker said, ATAC has been picking up more work from the Marines. But the big carrot dangling in front of the ADAIR community is that huge Air Force contract. More accurately, it’ll be a series of Air Force contracts with enough flying work to keep all the ADAIR providers busy. “We’re looking at F-16s, Mirage 2000s and other western — and even eastern — bloc aircraft to assess whether they have the pedigree we need, whether they’re okay from a condition standpoint and whether they’re supportable and sustainable,” Parker said. In the case of the third-generation F1s, ATAC will be upgrading the onboard radars and avionics, though exact details are being kept under wraps so that competitors won’t be able to set ATAC’s F1 technical upgrades as a target to beat during the contract-bidding process. The F1s — and potentially other planes yet to be acquired — will be modified to accommodate various electronic packages, or pods, that can make it appear to frontline military pilots like they’re going up actual modern opponents flown by potentially hostile near-peer air forces. ATAC will continue to fly its existing fleet of two dozen or so older jets — Kfirs, 1950s-era Hawker Hunters and 1970s-era L-39 Albatross jet trainers built by Aero Vodochody for the former Czechoslovakian Air Force. Those aircraft will continue to be based at ATAC’s headquarters in Virginia, where they remain effective at simulating air defense assaults against aircraft carriers and other ships at sea, and at helping hone carrier-based pilots’ skills just prior to their deployments to the Mediterranean and Red seas. But those older types occasionally will cycle through ATAC’s Alliance base, which in a couple of years likely will be the company’s largest base of employment. In addition to the new facility at Alliance Airport in Fort Worth, ATAC has gained access to the same flight-test ranges in west Texas long used by military jets and Lockheed Martin (and General Dynamics before that) for putting their F-16s, and, these days, their F-35s through their paces after rolling off Lockheed’s assembly line in west Fort Worth. The Secretary of the Air Force’s office announced on 10 December that the B-21 RAIDER weapon system – the US Air Force’s next strategic bomber – underwent a multi-disciplinary critical design and technical review in late November, aimed at ensuring the aircraft has a stable and mature design as the programme moves forward into manufacturing and flight test. The programme is run by the Air Force Rapid Capabilities Office (AFRCO). “This critical design event is key to maturing the design of the new bomber and to identifying risks that are consistent with all large acquisition programmes across the DoD [….] We are excited about where the programme is today and we’re looking ahead to actively manage the programme to first flight,” stated AFRCO Program Executive Officer, Randall Walden. The B-21 bomber is a long range, highly survivable aircraft capable of penetrating and operating in future anti-access, area denial (A2D) environments. The aircraft is expected to begin delivering initial capability in the mid-2020s. This radar, developed under the DARPA (Defense Advanced Research Projects Agency) ViSAR (Video Synthetic Aperture Radar) program operates at 235 GHz over multiple GHz of bandwidth and provides high resolution, video SAR imagery at a very low frame latency to support real time operations. The imagery is generated at a high refresh rate which provides the operator, whether on a manned platform or remotely piloted unmanned air vehicle (UAV) tactical situational awareness of moving targets or changes to stationary scene content. The system was flight tested onboard a DC-3 aircraft and flown in a variety of environmental conditions. The test results produced exceptional SAR imagery and ground moving target indicator (GMTI) detections to validate many model based assumptions about the operation and RF performance in this frequency band. The DARPA ViSAR program objective is to integrate state of the art technologies and demonstrate an airborne sensor that can engage ground areas of interest in all weather conditions. A sub-Terahertz (THz) radar like the ViSAR system provides the cloud penetrating capability to allow sensor operation under all weather conditions, particularly through the cover of clouds. Fig. 1 is a notional scenario from an AC-130 looking through clouds. The system is designed with flexible waveforms and a low latency signal processing architecture to support real-time operations. The Raytheon team along with a team of world class subsystem providers developed, integrated, and tested the world's first 235 GHz Airborne Video Synthetic Aperture Radar (SAR) system. A successfully executed flight campaign demonstrated key system capabilities and performance metrics. The ViSAR System is designed to meet latency, frame rate, image quality, and target detection objectives while operating under all weather conditions. The transmit pulse bandwidth is sized to achieve a fine range resolution in the ground plane. Given the short frame rate requirement, square image pixels in the ground plane at a slant range of 4 km are generated using an airborne demonstration platform which can exceed ground speeds of 80 m/s. Will ViSAR Revolutionize Close Air Support? Soldiers slogging it out on the ground will get a much-needed boost when Video Synthetic Aperture Radar (ViSAR) technology takes the field. The miniaturized extremely high-frequency band (EHF) sensor, developed by the Defense Advanced Research Projects Agency (DARPA), promises uninterrupted imaging of moving and stationary ground targets when sensors are blinded by the dust and smoke of battle or when clouds obscure their view. Now a flight-tested prototype, ViSAR aims to close these gaps and provide tactical situational awareness — targeting information and battle damage assessment — throughout an engagement. The problem with close air support today is that, once an engagement starts, the aircraft can’t see. AC-130 gunships, for example, typically use infrared (IR) sensors to target and engage maneuvering forces on the ground. But once an action begins, “infrared sensors are unable to image through the dust caused by explosions and incoming rounds,” according to the ViSAR broad area announcement (BAA) dated Dec. 19, 2012. The program’s biggest achievement was the physical implementation of a working prototype that fits into a compact tactical gimbal, known as the Multi-Spectral Targeting System-B (MTS-B), said George Nowak, ViSAR program manager in DARPA’s strategic technology office. DARPA also had to develop hardware and image-processing software that works at the high end of the EHF band, which extends from 30 to 300 GHz. Northrop Grumman developed the exciter subsystem, L3 the high power amplifier, and Technical Service Corp. the processing algorithms, while Raytheon was the systems integrator. But the DC-3 flight test — to proof SAR electronics, pointing, data collection and processing systems — used geometries that are relevant to a range of potential transition platforms, Nowak said. The BAA language, he clarified, was “intended to provide guidance to potential bidders as to the desired form factor and size of the system.” Although the ViSAR development program concluded at the end of 2017, DARPA continues to tweak the design to improve the data presentation so visualization gets closer to the “natural” visualization provided by electro-optical and IR sensors, Nowak said. Future automatic target recognition and datalink applications may also be possible. This image has been resized. Click this bar to view the full image. The original image is sized 1200x1024.